Murdoch’s network has really gone in the toilet. It is what it is. But, there is an upside to what Phaux news pulled at their debate as it also put the final nail in the coffin to RedState and Erick Erickson. 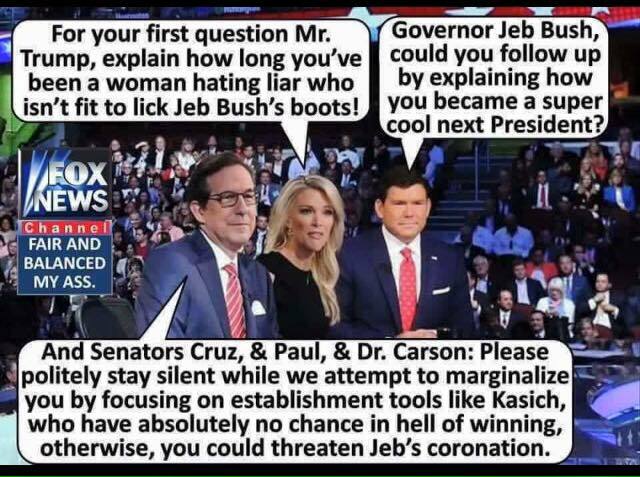 Do note that the candidates who participated at the RedState debate have lost my vote as well. They’re complicit. ← RESIGNATION?? IT’S NOT MY CALL. So Erickson takes to the stage to introduce his friend: “I love this guy“, “the most conservative governor“, Jeb Bush. " So let me get this straight? This TARP backing, common core supporting and ardent advocate for illegal aliens (because it due to.....loooove), is now a conservative. And here I thought that Todd Courser was having a credibility problem! So, she dresses like a headliner at Déjà Vu and made an appearance on Howard Stern's show with some not-so-very family friendly comments. I can't help but wonder how long she would be keeping her coveted 9pm time-slot if that clip ever made the rounds? Stick a fork into this "controversy"...it's done. "Even though Trump uses language about women I would never use, he has resolutely refused to apologize for his language about women who have attacked him. In fact, one could argue he’s showing women the ultimate respect of treating them as full equals. You want to punch me, he says, I’m going to treat you the same way I treat the guys."